Now you can be wearing this Dumbo And A Train T-Shirt. 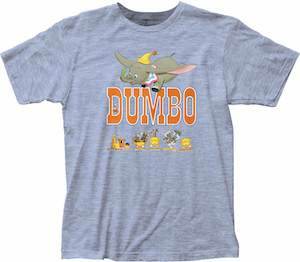 This Dumbo t-shirt is available in men’s sizes Small – 2XL and they are made from 65% polyester and 35% cotton and is tagless so nothing will be itching you. On the t-shirt, you find Dumbo the elephant just flying around above his name and below the name it shows a cute little train. So if you want a cute Disney t-shirt that also is all about a flying elephant then you are in luck as this is that Disney t-shirt that has it all and will get the world around you aware off this classic Disney movie.